Microbial heat shock proteins (hsp) have been associated with the generation and induction of Th1-type immune responses. We tested the effects of treatment with five different microbial hsp (Mycobacterium leprae, Streptococcus pneumoniae, Helicobacter pylori, bacillus Calmette-Guérin, and Mycobacterium tuberculosis) in a murine model of allergic airway inflammation and airway hyperresponsiveness (AHR). Mice were sensitized to OVA by i.p. injection and then challenged by OVA inhalation. Hsp were administered to each group by i.p. injection before sensitization and challenge. Sensitized and challenged mice developed increased serum levels of OVA-specific IgE with significant airway eosinophilia and heightened responsiveness to methacholine when compared with nonsensitized animals. Administration of M. leprae hsp prevented both development of AHR as well as bronchoalveolar lavage fluid eosinophilia in a dose-dependent manner. Treatment with M. leprae hsp also resulted in suppression of IL-4 and IL-5 production in bronchoalveolar lavage fluid, while IL-10 and IFN-γ production were increased. Furthermore, M. leprae hsp treatment significantly suppressed OVA-specific IgE production and goblet cell hyperplasia/mucin hyperproduction. In contrast, treatment with the other hsp failed to prevent changes in airway responsiveness, lung eosinophilia, or cytokine production. Depletion of γ/δ T lymphocytes before sensitization and challenge abolished the effect of M. leprae hsp treatment on AHR. These results indicate selective and distinctive properties among the hsp, and that M. leprae hsp may have a potential therapeutic role in the treatment of allergic airway inflammation and altered airway function. Heat shock proteins (hsp)3 are a highly conserved group of proteins produced by prokaryotic and eukaryotic cells, in response to a variety of environmental stressors (1, 2, 3, 4, 5). Although hsp are ubiquitous and highly homologous among different species, hsp constitute important target Ags of the immune response. Microbial hsp have been shown to be important immunogens stimulating both T and B cells (6). In recent years, it has become clear that members of the hsp families, mainly hsp60 and hsp70, are among the major Ags of pathogens that trigger an immune response (7). The hsp, immunodominant Ags of various microorganisms including mycobacteria, are a common target of T cell recognition (8) and increase reactivity of T cells (9, 10, 11). Especially microbial hsp have been associated with the generation and induction of Th1-type immune responses (12), and recent studies suggested that mycobacterial hsp65 induces immunostimulatory functions by increasing the production of monokines (13, 14, 15). Allergic asthma is a common chronic disease with an increasing prevalence, and is characterized by airway hyperresponsiveness (AHR), airway inflammation, and high serum IgE levels. In asthmatic subjects, activation and accumulation of eosinophils, mast cells, and T cells are evident in bronchial biopsies and in bronchial lining fluid (16, 17, 18, 19) and are considered to underlie the expression of the clinical disease. Because CD4+ T cells that produce IL-4, IL-5, and IL-13 (Th2 cells) have been found in the airways of asthmatics and because Th2 cytokines are required for the development of airway eosinophilia and IgE synthesis, it has been proposed that Th2 cells stimulate an inflammatory response that results in asthma (20). Because hsp administration has been associated with generation of Th1-type immune responses, we hypothesized that hsp could serve as an immunomodulator and affect the outcome of allergic sensitization. In this study, we tested the efficacy of five different microbial hsp as immunomodulators in a murine model of airway inflammation and AHR. We previously characterized a mouse model of allergic AHR and found that systemic sensitization and repeated airway challenge with OVA result in a Th2-type inflammatory response in which elevated serum levels of IgE and IgG1, AHR, and eosinophilic airway inflammation were associated with increases in IL-4 and IL-5 in the bronchoalveolar lavage fluid (BALF). We used this model to investigate the effects of hsp on airway responsiveness, pulmonary inflammation, and local cytokine production in the airways. Female BALB/c mice, 8–12 wk of age and free of pathogens, were obtained from The Jackson Laboratory (Bar Harbor, ME). The mice were maintained on OVA-free diets. All experimental animals used in this study were under a protocol approved by the Institutional Animal Care and Use Committee of the National Jewish Medical and Research Center. Mice receiving the following treatment were studied: 1) airway challenge with OVA alone in nonsensitized animals (nebulized (Neb)); 2) sensitization with OVA and OVA airway challenge (i.p. sensitization and nebulization (IPN)). Mice were sensitized by i.p. injection of 20 μg OVA (grade V; Sigma-Aldrich, St. Louis, MO) suspended in 2.25 mg aluminum hydroxide (Alum Imuject; Pierce, Rockford, IL) in a total volume of 100 μl on days 1 and 14. Mice were challenged via the airways using nebulized OVA (1% in PBS) for 20 min on days 24, 25, and 26 with an ultrasonic nebulizer (DeVilbiss Health Care, Somerset, PA). rHsp were obtained from StressGen Biotechnologies (Victoria, Canada). Five microbial rhsp from different microorganisms were used in this study (Mycobacterium leprae, Streptococcus pneumoniae, Helicobacter pylori, bacillus Calmette-Guérin (BCG), and Mycobacterium tuberculosis). The purified, rhsp contained <50 ELISA units endotoxin/mg protein. On days 1, 14, and 24, 100 μg hsp, dissolved in 100 μl PBS, was administered to each group by i.p. injection 2 h before sensitization or challenge. Unless otherwise stated, the dose of each hsp administered was 100 μg. As a control, mice were administered PBS. Airway function was assessed on day 28, and mice were sacrificed to obtain tissues and cells for further assay. In each experiment, each group consisted of four mice. All experiments were repeated at least twice. To deplete γ/δ T lymphocytes, mice were injected with 200 μg of a hamster mAb against TCR-δ (GL3) via the tail vein (21). Control mice received hamster IgG. One day after this injection, mice were sensitized and either nontreated or treated with 100 μg with M. leprae hsp following the protocol described above. Airway responsiveness was assessed in two ways, in one using single-chamber whole body plethysmography (Buxco Electronics, Sharon, CT), as described previously (22). Enhanced pause (Penh) was used as the measure of airway responsiveness in this study. In the plethysmography, mice were exposed for 2 min to nebulized PBS and followed by increasing concentrations of nebulized methacholine (MCh) (3–50 mg/ml in PBS) (Sigma-Aldrich) using an AeroSonic ultrasonic nebulizer (DeVilbiss). After each nebulization, recordings were taken for 3 min. The Penh values measured during each 3-min sequence were averaged and were expressed for each MCh concentration as the percentage of baseline Penh values measured after PBS exposure. There were no significant differences in any of the treatment groups for baseline (PBS) Penh. Baseline Penh values were 0.6 ± 0.2 (mean ± SEM). Airway resistance (RL) and dynamic compliance (Cdyn) were determined as a change in airway function after aerosolized MCh challenge. Mice were anesthetized with sodium pentobarbital (90 mg/kg), tracheotomized, and mechanically ventilated at a rate of 160 breaths/min with a constant tidal volume of air (0.2 ml). Lung function was assessed as previously described (23). A four-way connector was attached to the tracheostomy tube (stainless steel cannula, 18G), with two ports connected to the inspiratory and expiratory sides of two ventilators. Ventilation was achieved at a rate of 160 breath/min, tidal volume of 150 μl with a positive end-expiratory pressure of 2–3 cm H2O delivered by the ventilator (model SN-480-7-3; Shinano Manufacturing, Tokyo, Japan). Aerosolized MCh was administered for 8 breaths at a rate of 60 breath/min, tidal volume of 500 μl by a second ventilator (model 683; Harvard Apparatus, South Natick, MA) in increasing concentrations (1.56, 3.125, 6.25, and 12.5 mg/ml). After each MCh challenge, the data were continuously collected for 1–5 min, and maximum values of RL and minimum values of Cdyn were taken to express changes in these functional parameters. After assessment of airway responsiveness, lungs were lavaged via the tracheal cannula with HBSS (1 × 1 ml, 37°C). The number of BAL cells was measured by cell counter (Coulter Counter; Coulter, Hialeah, FL). Cytospin slides were stained with Leukostat (Fisher Diagnostics, Pittsburgh, PA) and differentiated in a blinded fashion by counting 200 cells counted under immersion oil at 1000 × magnification. Cytokine levels in BALF supernatants were determined by ELISA, as previously described (24). Measurements of IL-10 and IFN-γ were performed by using OptEIA kits (BD PharMingen, San Diego, CA), following the manufacturer’s protocol. The limits of detection were 4 pg/ml for IL-4 and IL-5, and 10 pg/ml for IL-10 and IFN-γ. Total IgE levels and OVA-specific IgE, IgG1, and IgG2a Ab levels in the serum were measured by ELISA, as previously described. (25). Briefly, Immulon-2 plates were coated with 5 μg/ml OVA. After addition of serum samples, a biotinylated anti-IgE Ab (02122D; BD PharMingen) was used as the detecting Ab, and the reaction was amplified with avidin-HRP (Sigma-Aldrich). To detect IgG1 and IgG2a, alkaline phosphatase-labeled Abs (02003 E and 02013 E; BD PharMingen) were used. The OVA-specific Ab titers of samples were related to an internal pooled standard, which was arbitrarily assigned to be 500 ELISA units. The total IgE level was calculated by comparison with a known mouse IgE standard (55 3481; BD PharMingen). The limit of detection was 100 pg/ml for IgE. Peribronchial lymph node (PBLN) cells were purified, as previously described (26). Cells were plated at 4 × 105/ml in 96-well round-bottom tissue culture plates in triplicate and incubated with medium alone or OVA (100 μg/ml) for 48 h in a humidified atmosphere of 5% CO2 at 37°C. Cell-free supernatants were harvested and stored at −20°C pending cytokine ELISA. After obtaining the BALF, lungs were inflated through the trachea with 2 ml of 10% Formalin and then fixed in the same solution by immersion. Tissue sections, 5 μm thick, were affixed to microscope slides and deparaffinized. The sections were stained with periodic acid Schiff (PAS) for identification of mucus-containing cells, and examined under light microscopy. Eosinophils were identified by immunohistochemistry using a rabbit anti-mouse eosinophilic major basic protein (MBP) Ab (provided by J. J. Lee, Mayo Clinic, Scottsdale, AZ), as previously described (26). The slides were examined in a blinded fashion with a Nikon microscope equipped with a fluorescein filter system (Nikon, Garden City, NY). ANOVA was used to determine the levels of difference between all groups. Comparisons for all pairs were performed by Tukey-Kramer honest significant difference test; p values for significance were set to 0.05. Values for all measurements were expressed as the mean ± SEM. To assess the effects of hsp treatment on the development of AHR after systemic sensitization and airway challenge with OVA, we measured in vivo airway responsiveness to aerosolized MCh by whole body barometric plethysmography. Fig. 1⇓ illustrates that mice that were sensitized and challenged with OVA and treated with PBS i.p. 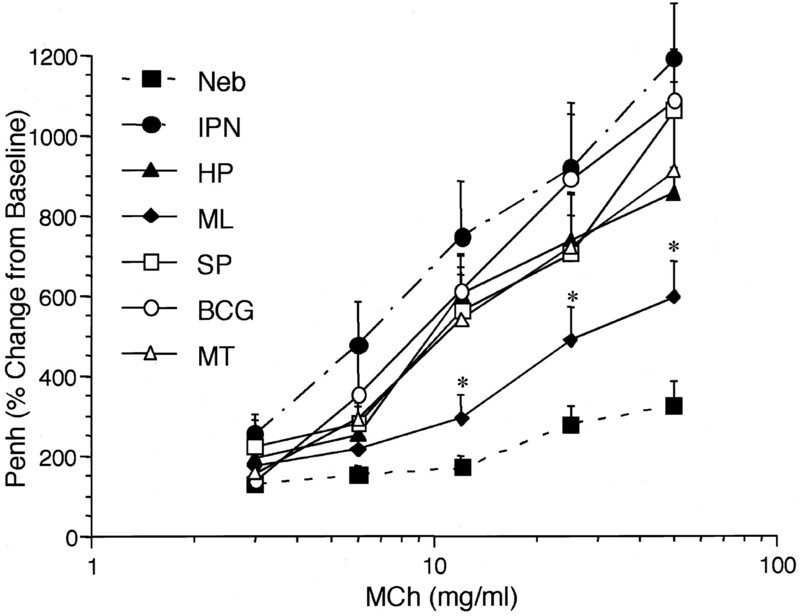 (control) demonstrated a significant dose-dependent increase in Penh in response to inhaled MCh when compared with control mice. Mice that were treated with M. leprae hsp showed significantly reduced Penh compared with mice treated with PBS (p < 0.05). In contrast, the other hsp failed to show significant inhibitory effects on the development of AHR, even at doses up to 200 μg. Increasing or decreasing the dose of M. leprae hsp (200, 50, or 10 μg) showed dose-dependent effects of the hsp on prevention of development of AHR (Fig. 2⇓A). The development of AHR after sensitization and airway challenge was not affected when M. leprae hsp was administered only before sensitization or only before airway challenge (data not shown). M. leprae hsp prevents the development of AHR. Groups of mice were sensitized, challenged, and treated, as described in Materials and Methods. Control mice (Neb) received three aerosol challenges to OVA alone. Airway reactivity to increasing concentrations of inhaled MCh was measured 48 h after the last challenge in unrestrained, conscious mice, and Penh values were determined. 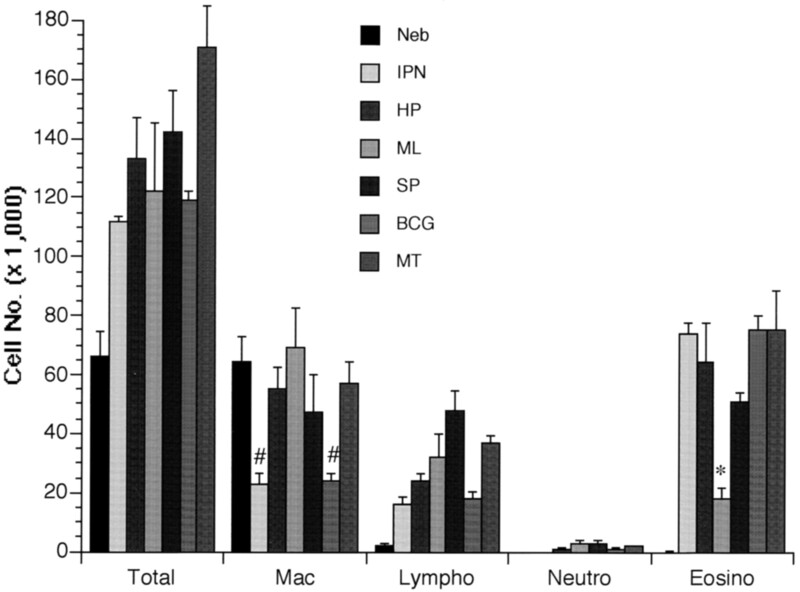 Mean ± SEM of Penh values are the results obtained from eight mice (two independent experiments) and are expressed as the percentage of baseline Penh values observed after PBS exposure. ∗, Significant difference (p < 0.05) between M. leprae-treated group and sensitized/challenged group (IPN) and other hsp-treated groups. HP, H. pylori; ML, M. leprae; SP, S. pneumoniae; MT, M. tuberculosis. Dose-dependent effect of M. leprae hsp on AHR and airway inflammation. A, Dose-dependent effect of M. leprae on AHR. To determine the dose-dependent effects of M. leprae on AHR, Penh values were obtained in response to increasing concentrations of MCh in mice that were treated with different doses of ML (M. leprae) hsp. ML200, 200 μg treated group; ML100, 100 μg; ML50, 50 μg; ML10, 10 μg. B, Accumulation of eosinophils in BALF was inhibited by M. leprae hsp treatment in a dose-dependent manner. Cellular composition of BALF was determined in the mice that were treated with different doses of M. leprae hsp and in OVA-sensitized and challenged (IPN) mice, as described in Materials and Methods. Mice were sensitized and investigated 48 h after last aerosol exposure, as described in Materials and Methods. Expressed are the means ± SEM (n = 8) of eosinophil numbers. ∗, Significant difference, p < 0.05 vs IPN and between the groups as indicated. Eosinophilic airway inflammation is an important outcome of allergen-induced airway sensitization and challenge. To determine the effects of microbial hsp on the inflammatory response following allergic sensitization and challenge, the cellular content of BALF was assessed. Mice sensitized and challenged with OVA developed significant airway inflammation with a predominance of eosinophils. Control mice that received 3 days of aerosol challenge to OVA alone had almost no eosinophils in the BALF. Administration of M. leprae hsp before sensitization and challenge prevented the increase in eosinophil numbers in the BALF (Fig. 3⇓). The other microbial hsp failed to show a significant inhibitory effect on eosinophil accumulation in lungs. Altering the dose of M. leprae hsp (200, 50, or 10 μg) showed a dose-dependent effect on BALF eosinophil numbers (Fig. 2⇑B). Mice treated with hsp, with the exception of BCG hsp-treated mice, showed significantly (p < 0.05) higher numbers of macrophages compared with the untreated sensitized and challenged mice. When M. leprae hsp was administered alone before sensitization or before airway challenge, no effect was seen on eosinophil numbers compared with PBS-treated, sensitized, and challenged mice (data not shown). Treatment with M. leprae (ML) hsp prevents eosinophil airway infiltration. To determine the effects of hsp on inflammation following allergic sensitization and challenge, the cellular content of BALF was assessed. Mice were sensitized and investigated 48 h after last aerosol exposure, as described in Materials and Methods. The absolute number of each cell type is expressed. Data represent the mean ± SEM of the number of the different cell types from eight mice in two independent experiments. Eosino, eosinophil; Mac, macrophage; Lympho, lymphocyte; Neutro, neutrophil. ∗, Significant difference (p < 0.05) between ML-treated group and the sensitized/challenged or other hsp-treated groups. In parallel to examination of BALF, lung tissue was examined. Evidence of eosinophil infiltration and the effects of microbial hsp were further investigated through histological examination of tissue stained with anti-MBP (Fig. 4⇓). In mice challenged alone, few eosinophils were detected in the peribronchial and perivascular tissues (Fig. 4⇓A). In contrast, sensitization and subsequent airway challenge resulted in significant increases in numbers of peribronchial and perivascular eosinophils (Fig. 4⇓B). Treatment with M. leprae hsp abolished the eosinophil accumulation in the peribronchial and perivascular areas (Fig. 4⇓C). The other hsp did not significantly alter eosinophil infiltration (data not shown). M. leprae hsp treatment abolishes eosinophil accumulation in the peribronchial-perivascular tissue. Immunolabeling of eosinophil MBP in lung tissue sections was performed. A, Representative tissue section from a mouse that received OVA challenges alone; B, representative tissue section from mice that received i.p. sensitization and challenge with OVA through the airways; C, representative tissue section from mice that received treatment with M. leprae hsp 2 h before each sensitization and the first OVA challenge. Final magnification: ×64. Th2 cytokine production by T cells plays a key regulatory role in the induction of allergic airway inflammation and AHR. To evaluate the effects of microbial hsp in the prevention of induction of Th2 responses, we measured concentrations of IL-4, IL-5, IL-10, and IFN-γ, 48 h after the last OVA challenge in BALF. As shown in Fig. 5⇓, sensitization and challenge resulted in increases in IL-4 and IL-5 and significant decreases (p < 0.05) in IL-10 and IFN-γ levels. M. leprae hsp treatment of sensitized/challenged mice significantly (p < 0.05) reduced the levels of IL-4 and IL-5 in the BALF compared with untreated mice (IPN group) (Fig. 5⇓). In contrast, M. leprae hsp treatment significantly increased both IFN-γ and IL-10 levels in BALF compared with IPN group. There were no significant differences between treated and untreated groups regarding the other hsp (data not shown). Effect of M. leprae hsp on cytokine levels in BALF of sensitized and challenged mice. 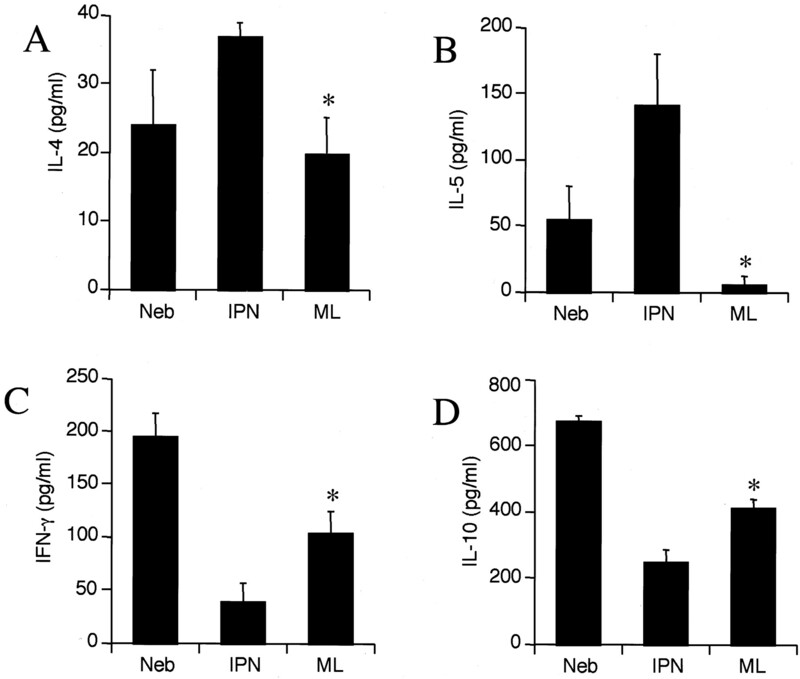 BALF IL-4 (A), IL-5 (B), IL-10 (C), and IFN-γ (D) levels were determined in M. leprae hsp-treated mice and in OVA challenge alone (Neb) and in OVA-sensitized and challenged (IPN) mice by ELISA, as described in Materials and Methods. Results of each group are expressed as mean ± SEM (pg/ml) of eight mice (from two independent experiments). 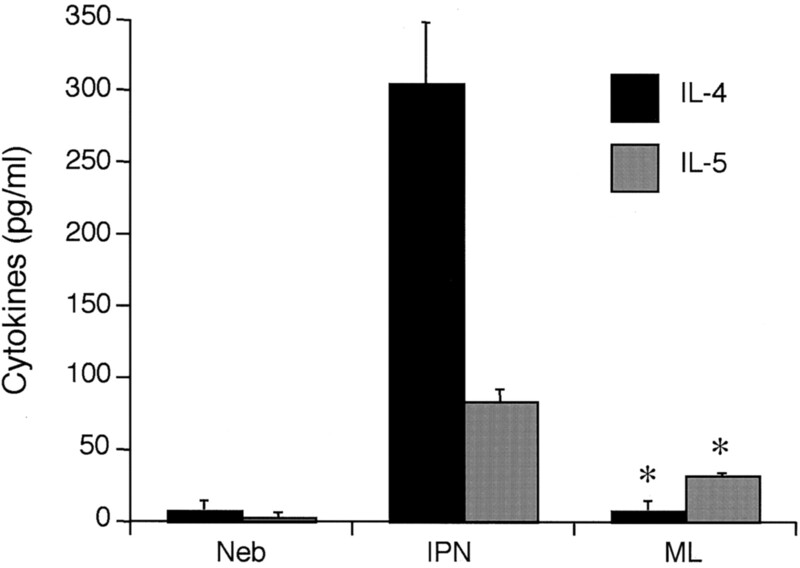 ∗, Significant differences (p < 0.05) between M. leprae hsp-treated group and IPN group. To monitor local cytokine production, mononuclear cells, isolated from PBLNs, were cultured and stimulated with OVA. Concentrations of IL-4 and IL-5 in culture supernatants were measured by ELISA. Sensitization and subsequent airway challenge with OVA resulted in increased production of IL-4 and IL-5 by PBLN cells in culture (Fig. 6⇓). PBLN cells from mice treated with M. leprae hsp showed significantly lower IL-4 and IL-5 production in OVA-stimulated cultures compared with untreated mice. M. leprae (ML) hsp treatment of mice down-regulates production of IL-4 and IL-5 by OVA-stimulated PBLN cells in vitro. PBLN cells from groups of mice were cultured for 48 h, as described in Materials and Methods, in the presence of medium alone or OVA (100 μg/ml). The culture supernatants were harvested and analyzed for cytokine release by ELISA. Results are expressed in pg/ml. Each condition was cultured in triplicate wells in each experiment. Data represent the mean ± SEM from eight mice for each group. ∗, Significant differences (p < 0.05) between ML hsp-treated groups and IPN group. Serum levels of OVA-specific and total IgE were measured 48 h after the last airway challenge. Sensitization and challenge with OVA resulted in significantly increased serum levels of OVA-specific IgE and total IgE when compared with mice challenged alone (p < 0.05). Treatment of mice with 100 μg of M. leprae hsp reduced OVA-specific IgE serum (but not total IgE) levels when compared with untreated controls (Fig. 7⇓). No such effects were observed after treatment with the other hsp. Increasing the M. leprae hsp dose (200 μg/injection) did not further reduce OVA-specific IgE levels (data not shown). Effect of M. leprae hsp on serum Igs. Serum total IgE (A) and OVA-specific IgE (B) were measured 2 days after the last airway challenge by ELISA. The results for each group are mean ± SEM from eight mice. ∗, Significant differences (p < 0.05) between M. leprae hsp-treated groups and the sensitized/challenged group. Lung sections were stained with PAS to identify mucus-containing cells in the airway epithelium. A large number of cells staining positive for mucus were found in sensitized and challenged mice compared with mice challenged alone (Fig. 8⇓, A and B). Treatment with M. leprae hsp inhibited goblet cell hyperplasia and mucin hyperproduction (Fig. 8⇓C), whereas such differences were not seen following treatment with the other hsp (data not shown). M. leprae hsp prevents goblet cell hyperplasia and mucin hyperproduction in airway epithelium. Histologic examination of lung sections stained with PAS identified mucus-containing cells in the airway epithelium. A, Representative tissue section from a mouse that received OVA challenge alone; B, representative tissue section from a mouse that received i.p. sensitization and challenge with OVA through the airways; C, representative tissue section from a mouse that received treatment with M. leprae hsp 2 h before each sensitization and the first OVA challenge. Final magnification: ×200. Hsp can activate γ/δ T cells (27) and γ/δ T cells can be negative regulators of airway responsiveness (21). To assess the role of γ/δ T lymphocytes in mediating the effect of treatment with M. leprae hsp on AHR, we depleted γ/δ T lymphocytes by injection of TCR-δ mAb 1 day before initial sensitization. Airway responsiveness to MCh was measured in anesthetized, tracheotomized, and ventilated animals 48 h after the last airway challenge using whole body plethysmography. There were no significant differences in baseline RL and Cdyn values between the different groups. Mice injected with the Ab and then subsequently sensitized and challenged showed the same degree of airway responsiveness to inhaled MCh as the sensitized and challenged alone mice (Fig. 9⇓). Treatment with 100 μg M. leprae hsp prevented the increases in RL and reductions in Cdyn throughout the MCh dose-response curve, results similar to the findings monitoring Penh (Figs. 1⇑ and 2⇑). However, M. leprae-treated mice that received the anti-δ Ab developed the same degree of AHR as the sensitized and challenged mice (which received control hamster IgG) (Fig. 9⇓). Following anti-δ treatment, BAL eosinophil numbers and cytokine levels remained unchanged (data not shown). RL (A) and Cdyn (B) values were obtained in response to increasing concentrations of inhaled MCh, as described in Materials and Methods. Data represent the mean ± SEM (all groups, n = 8). Sensitized mice (IPN) and γ/δ T cell-depleted sensitized mice (anti-δ) responded to MCh, whereas nonsensitized mice (Neb) showed smaller changes in RL and Cdyn in response to MCh. Treatment with M. leprae hsp of sensitized mice (ML hsp) receiving hamster IgG significantly decreased the responsiveness to MCh throughout the dose-response curve. However, treatment with M. leprae hsp was not effective in reducing AHR in sensitized mice receiving anti-δ before the hsp administration (anti-δ ML hsp). ∗, Significant difference (p < 0.05) compared with the nonsensitized and M. leprae hsp-treated mice. In this study, we show that M. leprae hsp was effective in preventing the development of AHR and airway inflammation in a murine model of allergic airway inflammation. Moreover, when compared with four other microbial hsp, the effects on airway function and inflammation and cytokine production were restricted to treatment with M. leprae hsp. M. leprae hsp administered to sensitized and challenged mice resulted in decreases in eosinophilic inflammation, Th2 cytokine production, Ag-specific IgE, goblet cell hyperplasia, and in normalization of airway function. During specific types of inflammation, including arthritis and severe asthma (28), a stress response is induced, which results in the production of hsp (2). Cytokines can stimulate T lymphocytes to produce hsp70 (5), and arachidonate and PGA1 activate heat shock transcription factors (29, 30, 31). Production of hsp presumably protects cells against the inimical effects of stress (1, 32). Of possible relevance to asthma, allergen-induced inflammation might result in stress induction in airway epithelium (33), and alveolar macrophage phagocytosis of eosinophils elicits heat shock protein synthesis (34). Recently, hsp70 up-regulation was demonstrated to be present in patients with bronchial asthma (35). In this study, we demonstrate that treatment of mice with M. leprae hsp before sensitization and airway allergen challenge significantly inhibited the development of AHR. Furthermore, eosinophilia in the lung tissue and airways was prevented after treatment with M. leprae hsp, but not with the other hsp. These findings imply that despite their enormous conservation in amino acid sequences (36), microbial hsp differ in their immunological properties. T cells play a key role in allergic asthma because upon recognition of allergen they are capable of releasing large amounts of Th2-type cytokines, including IL-4 and IL-13, which are required for IgE production and goblet cell hyperplasia, and IL-5, which is essential to the development of tissue eosinophilia (37). T cells are activated (17, 19, 38, 39) and express mRNA encoding IL-4, IL-5 (40), and IL-4, and IL-5 are produced by a subtype of Th cells (41), which predominates in chronic asthma (42, 43). Because allergic asthma is thought to be regulated by Th2 cells, interfering with this arm of the immune response may be an attractive mode for intervention (44, 45). T cells capable of recognizing hsp are induced during the natural establishment of microflora on the skin or in the gut and are capable of recognizing conserved epitopes such as hsp. These responses to hsp provide an initial defense against infectious agents before the development of immunity to novel Ags has begun (46). We show that M. leprae hsp treatment altered the local cytokine profile following allergen challenge of sensitized mice, decreasing IL-5 production and increasing IL-10 and IFN-γ levels in the BALF. These results were confirmed in in vitro cultures of OVA-stimulated mononuclear cells from PBLN. Downstream of these cytokine effects were specific consequences including reduced eosinophilic numbers in the BALF and lung tissue, and reduced serum levels of Ag-specific IgE; staining of the epithelium confirmed the elimination of goblet cell hyperplasia and mucin hyperproduction that followed allergen challenge of sensitized mice. These findings parallel those reports in which microbial hsp have been associated with the generation and induction of Th1-type immune responses (12) and induced Th1-like activity in CD4+ T cells from leprosy patients and healthy individuals (47). One possible mechanism mediating the activity of M. leprae hsp involves γ/δ T cells. γ/δ T cells are stimulated by mycobacteria, especially mycobacterial hsp65 (48). Born et al. (49) showed that γ/δ T cells could specifically respond to a small synthetic peptide corresponding to the same region of M. leprae hsp in vitro and in vivo (50). γ/δ T cells have been shown to negatively regulate airway responsiveness (21). Thus, one possibility is that administration of M. leprae hsp could activate γ/δ T cells, resulting in the down-regulation or prevention of AHR. To investigate this hypothesis, we used an anti-δ mAb before the hsp administration and sensitization. This Ab has been shown to deplete γ/δ T cells (21) and was confirmed in this study. Indeed, injection of this Ab virtually eliminated the effects of M. leprae hsp on AHR, suggesting a very critical role of γ/δ T cells in mediating the effects of M. leprae in this model as previously described. As described previously (21), the effects of this Ab were not mediated through alteration in lung inflammation as eosinophil numbers and cytokine levels remained unchanged. Other cell types, such as dendritic cells, might also play a role in the activity of M. leprae hsp. Recently, Todryk et al. (51) showed that induction of hsp expression induces an infiltrate of T cells, macrophages, and predominantly dendritic cells into the tumors, Th1 cytokine expression (IFN-γ, TNF-α, and IL-12), and enhances immunogenicity via a T cell-mediated mechanism. They also demonstrated that hsp targets immature APC to make them significantly more capable of capturing Ags, and triggering a Th1 response. Sensitization and challenge normally result in a decrease in BALF IL-10 levels, a cytokine associated with antiallergic and anti-inflammatory activities. M. leprae hsp resulted in increased IL-10 levels in the sensitized and challenged mice. Such data suggest that the cross-reactivity between M. leprae hsp and host hsp may activate regulatory T cells to release important regulatory cytokines such as IL-10, and as a result, the increase in IL-10 may have played a role in the down-regulation of Th2 cytokine production (52). Intraperitoneal administration of M. leprae hsp generated regulatory mechanisms that reduced the activity of cells present in the lymph nodes responsible for allergic airway inflammation induction (52). This notion is supported by the in vitro observations of cytokine production in cultures of PBLN cells from M. leprae-treated mice in which OVA-stimulated IL-4 and IL-5 production was inhibited. It is unclear at the present time and somewhat surprising that the significant regulatory effects on airway responsiveness, inflammation, and cytokine production were so restricted to M. leprae hsp. Simple explanations such as differences in endotoxin content were eliminated, as endotoxin content did not differ among the various hsp (data not shown). Despite extensive homology, M. leprae hsp65-specific epitopes have been described, which are distinguishable from the analogous sequences, for example, from the 65-kDa M. tuberculosis protein (53). Whether or not these unique sequences serve as the T cell-stimulating sequences, conferring protection in the allergen-induced models, remains to be determined. Although BCG hsp was not generally effective in our model, infection with an attenuated form of M. bovis BCG was an effective inhibitor in similar models of OVA-induced airway eosinophilia, local IL-5 production, and AHR, suggestively through increased IFN-γ production (54, 55). These differences between BCG hsp and BCG infection/immunization could reflect the potency of mycobacterial DNA (CpG oligonucleotides or immunostimulatory sequences) in triggering a Th1 response and preventing lung inflammation and AHR (56, 57). In summary, M. leprae hsp was very effective in the regulation of inflammation in this murine model of airway inflammation and AHR. Following treatment with M. leprae hsp, the mice failed to develop allergen-induced Th2 responses, lung eosinophilia, and AHR. The activity of M. leprae hsp especially on the reduction of AHR appeared, at least in part, to be mediated through γ/δ T cells. The results of this study suggest that hsp administration can modify allergen-induced airway inflammation and hyperresponsiveness following allergen sensitization and challenge. We thank Diana Nabighian and Lynn M. Cunningham for their technical assistance. ↵1 This work was supported by the National Institute of Health (HL-36577, HL-610051, HL-65410) and the Environmental Protection Agency (R825702). Y.-H.R. is recipient of the Florence Myers Goldhamer Fellowship. C.T. is recipient of the Michael and Eleanore Stobin Fellowship. ↵3 Abbreviations used in this paper: hsp, heat shock protein; AHR, airway hyperresponsiveness; BAL, bronchoalveolar lavage; BALF, BAL fluid; BCG, bacillus Calmette-Guérin; Cdyn, dynamic compliance; IPN, i.p. sensitization and nebulization; MBP, major basic protein; MCh, methacholine; Neb, nebulized; PAS, periodic acid Schiff; PBLN, peribronchial lymph node; Penh, enhanced pause; RL, airway resistance.